With the rise of Finance and Technology combining to create disruptions in the economy, the need to create digital awareness has also increased. That is when S.P.Jain Institute of Management Studies organized an event for various topics covering Fintech requirements and business skills necessary to build a successful digital enterprise in India. 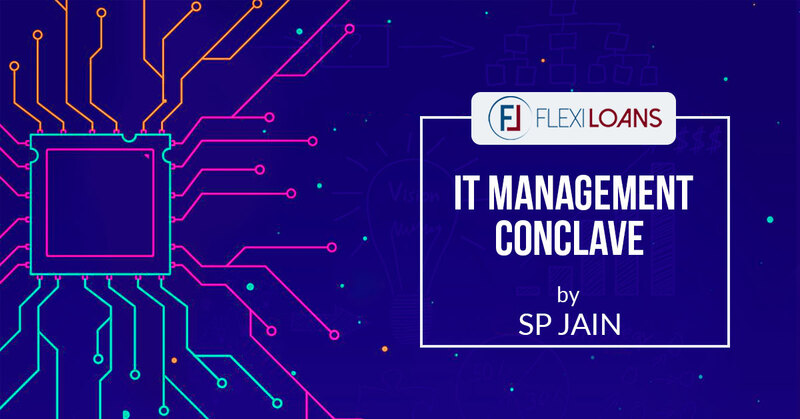 Abhishek Kothari, co-founder of FlexiLoans was invited as a guest panelist for IT Management Conclave 2018 by SP Jain School of Global Management. With FlexiLoans being in the space of Digital Lending and FinTech the inputs given by our co-founder were really apt for this event. Along with, FlexiLoans has been certified a ‘Great place to work’ by ‘Great Place to Work Institute’ hence giving insight on leadership and talent management by Abhishek Kothari helped with credible inputs at the event. “With great power comes great responsibility” – Spiderman. The growth and power with which the digital era is growing can disrupt the economy for the good but along the road, enterprises need to recognize their responsibilities to ensure the smooth sailing of this change. Whilst the market for the digital age has been growing manifold the challenges and opportunities have also increased citing a need to address these topics. When big players in the market organize such an event to ensure the smooth facilitating of leadership and governance in the digital age how could we miss an opportunity to attend the event and represent FlexiLoans? As the name of the event ‘IT Management Conclave – Leadership and Governance in the Digital Age: Building Successful Enterprise’’ the main highlight of the event was how players adapted to the changing technology, penetrated through them to ensure the optimum use of their resources. Another highlight of the event was to talk about the challenges different companies faced and what they did to combat those issues. Lastly, topics on governance and security measures were spoken on a digital age and security go hand in hand. The mechanization of work and the digital disruption of business models place a premium on leaders who can bring about a transformation in the system and place a positive outlook. With digital age changing almost every day it is not easy for enterprises to leave behind the traditional old methods and adopt new ones. Thus giving rise to an event like this where such topics were addressed as to how to combine traditional and digital qualities to run a better venture. IT leaders and professionals need to reset governance based on outcomes that deliver sustainable enterprise value fit for digital business. The panel discussion consisted of some great entrepreneurs from the field of SME, Fintech, who engaged in conversations and topics revolving around “Building Successful Digital Enterprise.” covering areas such as diversifying the business model through creative partnerships, strategic collaborations, and disruptive innovations and more. The panel focused on providing a clear digital vision and align business and IT strategies accordingly. Different panelists covered areas that facilitate clear accountability, clarity of roles and decision-making authorities related to digital strategy, policies and standards and areas such as risk management. Importance was also given on how to create a good work culture and ensure the seniors aren’t overpowering the juniors and if the leadership qualities are being instilled properly. The panel was also opened for a few Q&A questions giving the audience a chance to raise their concerns and having professionals address the issue with ease and comfort. Abhishek Kothari, co-founder of FlexiLoans attended the event as one of the many panelists representing FlexiLoans and also addressing issues on Digital Age and how to combat them. Having over 11 years of experience in the field of Big Data and Data Analytics Abhishek Kothari threw light upon major aspects of how to analyze data digitally and make inferences of them to draw business decisions. He also addressed issues on leadership and how to ensure that your workplace is an excellent environment to work in and how to use the various talents at the right time and place. One of the main aspects of a venture is setting its goals and targets but an even tougher task is how to ensure all employees are working towards that goal is what our co-founder addressed and gave viable solutions for. The event had CNBC TV 18 as their media partner and was conducted with a lot of poise and professionalism. The exposure received by FlexiLoans at the event really helped us with some fruitful insight on how to capitalize the Digital Age better. It also gave us a great platform to meet like-minded businesses and individuals and connect with people. After all, nothing is better than the good ol’ traditional networking days!